Aural Exchange provides sound proofing and acoustic treatment products, solutions, and consulting for project studios, home studios, commercial recording studios and broadcast studios in India. The relation of reverberation and sound pressure is a major factor in the sound insulation properties of a recording studio. Whereas the sound pressure of a voice or an instrument is relatively invariable, the target in the recording room is to effectively reduce the reverb time in order to achieve the perfect and ideal reverb time for the studio, which is best achieved by using profiled acoustic elements specifically designed for recording room dampening and recording room optimization. In order to achieve balanced recording studio acoustics, you can use recording studio acoustic elements. Our acoustic foam is available in a large variety of surfaces, such as pyramid foam with a triangular or trapezoidal profile. 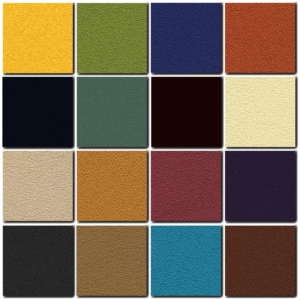 To combat flutter echoes, it is sometimes sufficient to line 30 per cent of the wall, ceiling and floor surface with recording studio sound absorbers to improve the sound in a rehearsal room or recording studio. 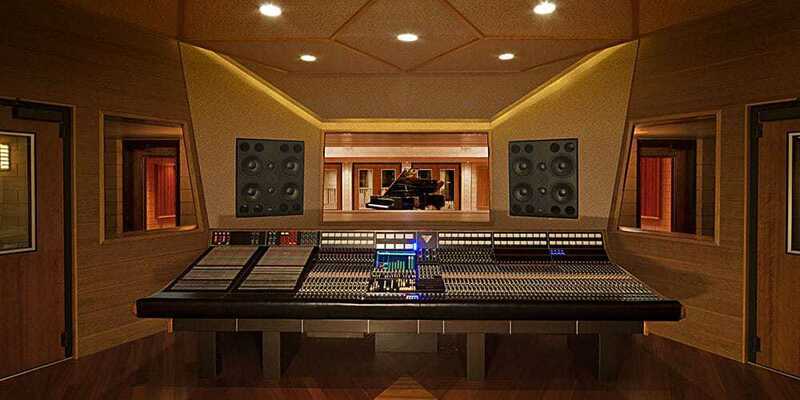 For outward recording studio sound insulation or for recording studio sounddampening in general, the best results are achieved through a large surface lining with broadband absorbers with high material thickness. This permits individual noise protection and solutions for different spatial forms and styles of music. Drum kit insulation and drum kit dampening in rehearsal rooms may not be neglected for optimal musical and recording results. How to insulate a dubbing room? Dubbing room insulation is important just like the recording studio setup. Another aspect is dubbing room soundproofing which is crucial for the location of a drum kit or E-drums within a recording studio. It requires an individual soundproof solution and special recording room acoustics. To improve the recording room acoustics we have to consider that apart from airborne sound, a drum kit also emits structure-borne sound in high-intensity to the floor, the floor beneath the drum kit must be acoustically decoupled by means of a drum pedestal: for recording studio insulation, the floor is covered with acoustic foam which is in turn covered with a floating floor wood panel. 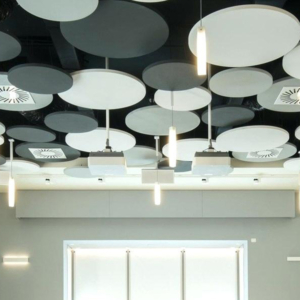 To improve rehearsal room acoustics, a floating sound absorber for recording rooms and recording studios that is mounted above the recording room drums kit constitutes an additional, elegant possibility to add an effective acoustic interior design highlight to recording and rehearsal room sound protection. We also produce specially designed high-quality sound insulating boards and rehearsal room acoustics foam on request. For commercial users, Aural Exchange products are available in different fire protection classes. Recording Studios are typically multi-room facilities that require maximum sound quality and minimum bleed from room to room. For broadcast, voice-over, recording, mixing, rehearsal, editing or dubbing, the ability to acoustically isolate one rooms noise from the next, and then control the reverberation times within each space, will play a critical role in the success of any music studio setting. More than any other commercial space we treat, there is no greater need for premium sound quality than the recording studio market. For new build or retrofit, the sound proofing treatments available at Aural Exchange are state-of-the-art and designed to meet your every need. 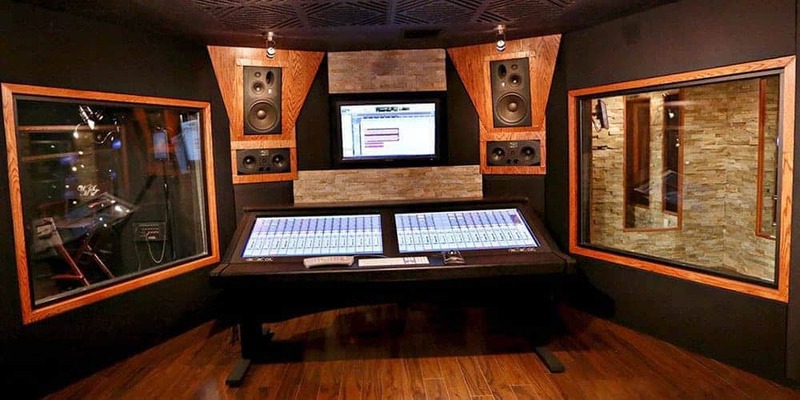 There are two steps involved in producing premium acoustics within a recording studio space. The first is to isolate one rooms noise from the next. The second is to produce premium sound quality within each room by controlling excessive reverb to deliver maximum clarity to original sound. To isolate one rooms noise from the next, you need to disconnect the rooms from each other using high density material. This “density + disconnection” sound proofing formula is the only one that works. Our proprietary layering system achieve 90% reduction in sound bleed through common surfaces. 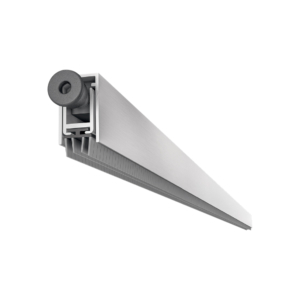 If you have a drop ceiling grid system, our high density ceiling panels can also achieve isolation for ceilings. Any common window treatments should be given careful thought. A full vertical window should have a triple pane glass assembly, each pane of glass a different thickness to help combat a different frequency pitch of noise, and the panes should be separated by an argon gas fill. The middle pane of glass should ideally be angled while the two outer panes are vertical. The level of leakage through any window, acoustic or otherewise, will depend on the quality of the installation. Something you should let the pro’s do. We also recommend the use of track lighting in your studio (if you have finished ceilings) rather than recessed lights. Any recess lighting will create new flanking paths for noise to bleed in and out of your room. Minimize the holes you need to cut into your surrounding walls and ceiling. If you have a drop grid ceiling tile system, anchor a set of Ceiling Caps atop your ceiling tiles to deaden sound bleed. Once your studio rooms are properly insulated from each other, then we attack the finished surfaces within each room to combat and absorb the unwanted sound wave reverberations. Without absorbing your echoes, your studio space will experience background noise that will distort the sounds you are creating. But with an absorption coefficient introduced to your studio, the background noise can be captured, collapsing your echoes and delivering greater clarity back to your original sounds. With Nankarrow and Ultracoustic sound panel systems capturing your echoes, premium sound quality is produced for both vocals and musical instruments. 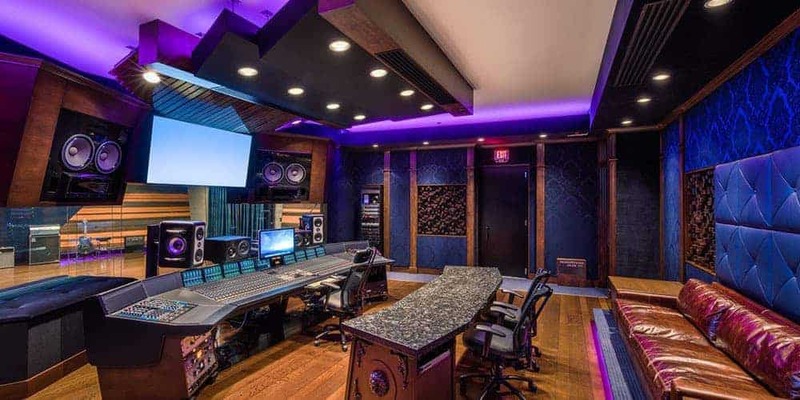 Note that the key to the success of your sound panel treatment for your recording studio space lies with the assurance that you are not under-treating your space with any of these panel systems. We safeguard to ensure that the right amount of material is specified for your studio based on the size, shape and surface textures of each room. Contact us for a free room analysis. For low budget residential projects, the Nankarrow NeoMax Pyramid Foam Panels are the most common treatment. These are lower cost, easy to self install acoustical foam panels designed to capure echo. Call our helpdesk or get in touch using the form below with your room’s dimensions, we will calculate how many panels your project will need based on room size. For commercial studio space, you can use a combination of Nankarrow acoustic foam panels and Ultracoustic heavy-duty panels. We can raise the STC values of a standard brick wall construction from an average of 38 to over 60 if your goal is to control the bleeding of noise through the common surfaces. Once the rooms are properly isolated, the absorption coefficients within each room can trigger NRC values that will absorb up to 90% of your unwanted reverberation within each room, leaving clear crisp sounds and harmonic tones for ultimate recording purposes. Accepted file types: jpg, gif, png, pdf, zip, rar.